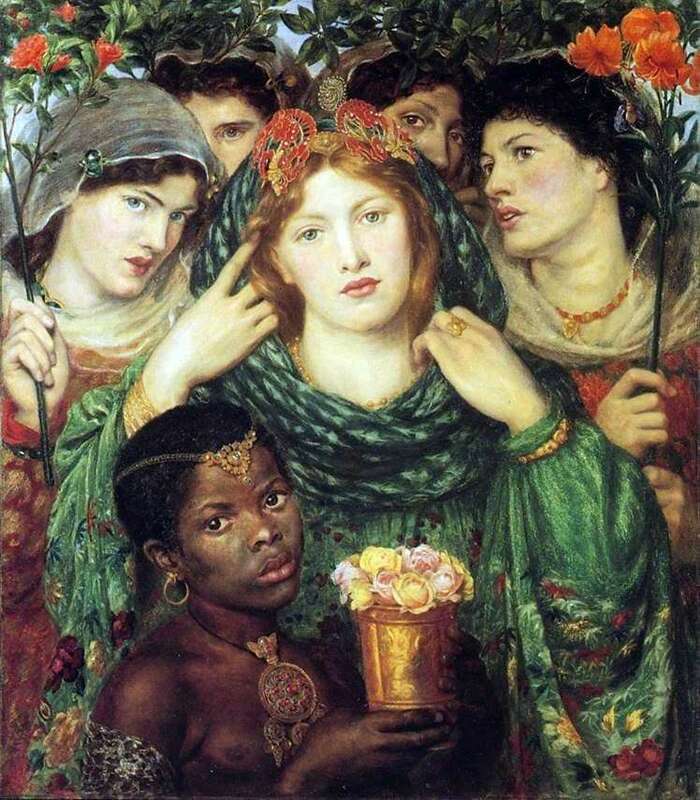 “Beloved” (also known as “The Bride”) – oil painting on canvas, written in 1865 by British artist of Italian origin Dante Gabriel Rossetti. Now she is in the London Tate Gallery. On the gilded frame, two passages are carved from the biblical canonical text known as the Song of Solomon. It is said that Rossetti, having finished work on the painting, nevertheless, in search of perfection, constantly made changes to it throughout its life. The main heroine of the picture, caught in the movement, lifts the veil, around her are four virgin girlfriends and an African boy servant. Everything on the canvas contrasts with the reddish hue of the hair and the pale skin of the bride: both the dark skin of the page, and the various shades of the dark hair of four girls, and their skin tone. Many experts have suggested that this technique of color contrast, which emphasizes all the features of the bride’s face, was used by Rossetti under the influence of a controversial picture of Edward Mane called “Olympia.” In 1865, while working on “The Beloved”, Rossetti visited the exhibition Manet and Olimpia made an indelible impression on him. Also, many find that in the “Beloved” felt the influence of the works of Titian himself. Rossetti paid special attention to the headdress and clothes of the bride and bridesmaids, in which an unimaginable combination of both Peruvian and Japanese national costume is clearly discernible. Yet this abundance of exotic fabric only frames the face of the bride, typically Western European type, which dominates the center of the canvas.